Anime/manga/otaku blog Japanator has relaunched its website with a new design, and Giapet.net has a review. 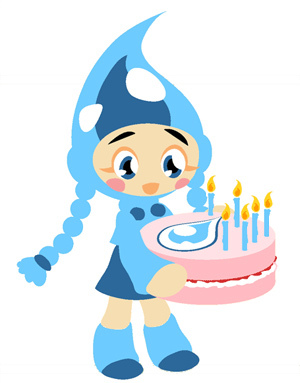 Sweatdrop Studios Turns Six Years Old! This week sees Sweatdrop Studios reach its sixth year as a manga collective! To celebrate this special occasion, they are giving a whopping 50% discount on their comics until 1st February 2008. Sweatdrop also offer free international shipping for orders over £15 (about US$30), so if you ever wanted to check out some UK-made manga, there couldn't be a better time. GRIMES, IA, January 18, 2008 - Anime producer and mega-online anime retailer Right Stuf, Inc. is pleased to welcome Zac Bertschy - executive editor of Anime News Network (AnimeNewsNetwork.com) and managing editor of Protoculture Addicts - to episode 58 of ANIME TODAY. In this new interview, Bertschy takes a look back at the successes and surprises of 2007, experiments in packaging and distribution, the differences between what series are popular with Japanese and Western fans, and the issues and challenges facing the North American anime industry in 2008. Lance Fensterman, who has been blogging from his vantage point as organizer of BookExpo America ever since he took the helm at the show in 2006, has re-designed and re-launched his blog. Manga news, review and scanlation website Manga Jouhou is celebrating its 5th anniversary. Hooray. Of course, no blog anniversary is complete without freebies. I'm going to offer you a gratis copy of what is without a doubt the best-book-of-2007-that-no-one-read; even if David Welsh couldn't convince you to shell out for copy of "Town of Evening Calm, Country of Cherry Blossoms," I'll take it upon myself to ship you one fo' free. Yes, that's right; free.